You may not believe in Santa Claus, but you'd better believe in Bandana Claus. He's real, and he delivers Christmas bandanas to young cancer patients in Costa Rica every year. His name is Bruce Kujawski, and he had a bandana supply problem till he discovered Wholesale For Everyone. 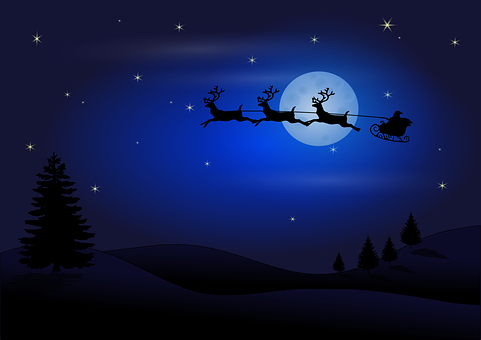 What would happen if Santa Claus couldn't get the gifts he needed for children on Christmas Eve – the right kind, in sufficient quantity, and on time? That would be a global catastrophe causing disappointment for children worldwide, wouldn't it? But then Santa has all those elves helping him out and making toys, so it's not likely to happen. Now, you may not believe in Santa Claus, but you'd better believe in Bandana Claus. He's real, and he delivers Christmas bandanas to young cancer patients in Costa Rica every year. His name is Bruce Kujawski, and he did have that supply problem . . . till he discovered Wholesale For Everyone. It all started 48 years ago when the family of a boy, Bruce Kujawski, in upstate New York welcomed an addition to the nine children they already had. That "addition" was a foreign exchange student from Costa Rica, Bernardo Gutierez. Bruce and Bernardo soon became brothers in every way except sharing blood. And they remained – and still do today – in contact after Bernardo graduated from West Point and returned to Costa Rica for good. Eventually, Bernardo married and had three children, to whom Bruce is "Uncle Bruce." At the age of just 15, Bernardo's youngest child, Daniel Arce, was diagnosed with osteosarcoma, a form of bone cancer. Daniel fought the disease for four years, all the while remaining committed to serving others, pursuing his music passions, and excelling academically. His brightly burning spirit inspired hope in those around him because Daniel did all this while undergoing cancer treatments and several major surgeries. Daniel graduated from high school with his class in 2006, attended Ramapo College in the fall of 2007, and became an accomplished guitarist, pianist, and vocalist. At Ramapo, he maintained a 4.00 GPA and tutored 30+ kids, all while undergoing treatments and eight major surgeries. Daniel passed away just one month before graduation. The Daniel Arce Scholarship is now awarded to the student who best exemplifies Daniel's spirit in helping others, especially peers. So after Daniel succumbed to the disease, Daniel Project (Proyecto Daniel) was born. Cancer treatment, especially chemotherapy, can be brutal for younger patients. The nausea, the weakness, the aches, and the hair loss can make the treatment as difficult to endure as the disease, particularly when hospital accommodations are rudimentary at best. Not every country has something like Ronald McDonald House to provide special rooms for the cancer-afflicted children and their parents to ease the anxiety and pain and bolster hope. Now in its eight year, Daniel Project is a non-profit organization dedicated to helping young people 13 to 25 years old overcome cancer in better facilities in Costa Rica. Daniel's mother, Ligia, who is president of the organization, explained: "The situation for teen cancer patients was terrible . . . The project has contributed to healthcare centers with orthopedic beds and the rebuilding of some healthcare institutions. I feel Daniel's fighting spirit present in this project." The organization has achieved amazing results for these young patients with dedicated rooms for them in several hospitals and an entire wing about to be added to one hospital for the purpose. It was, of course, inevitable that Bruce Kujawski would become involved with Daniel Project. It wasn't, however, clear in the beginning that he would become Bandana Claus. chemotherapy drugs target and suppress rapidly dividing cells, which is what cancer cells are and why cancer can spread so quickly. But these drugs also attack other healthy cells that divide rapidly, such as hair follicle cells, because the drugs indiscriminately affect both normal cells and cancer cells. As a result, many people receiving chemotherapy lose most or all of the hair on their heads (a condition known as alopecia). For young people such hair loss can be both disturbing and traumatic. To cope with this condition and to achieve a modicum of normalcy, many patients resort to wearing a hat or head covering of some sort. Younger patients often prefer something like a colorful bandana for their head covering. And Bandana Claus accommodates them. Bruce's proudest role in Daniel Project is distributing colorful bandanas to these young cancer patients at the annual Christmas party. For the past five years, he has been buying several hundred dollar's worth of bandanas (on his on dime), traveling to Costa Rica, dressing as Santa Claus, and then presenting these bandanas and other gifts to the patients. Bruce, or rather Bandana Claus, also visits all the young people who were too sick too attend the party. Why does he keep doing it? "These kids have done more to inspire me and to keep me going than anything." If you ask Bruce where he gets his bandanas, he doesn't hesitate to say, Wholesale For Everyone, of course." It took Bruce a while, though, before he hooked up with this bandana supplier. So. like most of us, Bruce went online and started searching. Those kids, after all, were depending on Bandana Claus. At length, Bruce came across Wholesale For Everyone. He was immediately impressed with the "extraordinary variety and the discount offered on large quantities," so he ordered a few bandanas to try them out. He was, he says, then impressed with the fast delivery and soon became a loyal customer. Today, Bruce gets all his bandanas, every year, from Wholesale For Everyone. Because, first of all, they carry the loud colors and designs that really appeal to the young cancer patients, such as the tie dyes and the star patterns. The other reason is the top-notch service. Here's an example . . .
A fairly recent order came up short. The manufacturer didn't have enough product to fill the order, and so they just didn't ship what they didn't have. While Bandana Claus may travel on a 747 instead of a flying-reindeer-drawn sleigh, he still has to deliver. The kids count on him, and he couldn't let them down. So Dan Weaver, owner of Wholesale For Everyone, called around to his competitors to find what Bruce needed. But the competitors didn't have them either. Dan's solution then was to make up the difference with some of his religious bandanas. They were a big hit, and Christmas was saved. Now that's customer service – for which both Bandana Claus and some young Costa Rican cancer patients were very grateful. Clause (as part of Daniel Project) strives to bring to certain young people afflicted with cancer in Costa Rica, along with some cool-looking bandanas, of course. Forty-eight years ago a young student from Costa Rica came to live with a large family in upstate New York. That young man became a brother to the family's eldest son. When, years later, Bernardo's son died after succumbing to cancer, Daniel Project was born, and Bruce Kujawaski became Bandana Claus. Many young lives have been profoundly impacted for the better and their suffering alleviated some. If you'd like to donate to Daniel Project, you can find the Facebook page here. And to get your own bandanas, with custom printing available, just go to WholesaleForEveryone.com or contact Dan here.